Rhododendrons are forgiving plants, but there are some things they just won’t tolerate. So, it is important to understand their basic requirements. First: Rhododendrons must have a constant supply of moisture. You may occasionally see a rhododendron that will survive without being watered, but it does so only under protest. Second: Rhododendrons must never sit in stagnant water. Roots submerged in poorly oxygenated water will likely die, though a plant may survive through better drained surface roots. Hot, wet conditions are more dangerous than cool, wet conditions. That is why a rhododendron will survive in a wet spot in the Northwest during heavy winter rains but would not survive in a wet spot in the Southeast’s heavy summer rains. Third: Rhododendrons must be grown in an acid medium (pH 5-6) that is coarse enough for the roots to have access to needed oxygen. Understand and provide these three conditions and you will succeed wherever you live. These requirements aren’t difficult to provide once you understand rhododendrons’ needs relative to your specific soil and climatic conditions. Now let’s talk about the actual planting medium to use. We’ll come back to natural soil later. There are a multitude of mediums available and almost any one of them, given the proper amounts of water and fertilizer, will produce healthy plants. Something is needed that will provide adequate air spaces in the soil, and the slower this material decomposes the better. Second, something is needed that will hold a certain amount of water so that the plant does not dry out too rapidly. Barks are generally quite good, as they usually contain both fine and rough textured materials. However, the much heavier, coarser bark rock will not work well for this purpose although it will work as a mulch. Since they are on the outside of the tree, constantly exposed to the weather, nature has endowed barks with a sort of natural preservative which slows their hreak-down and inhibits many root-rot fungi. The breaking down process of organic material requires nitrogen; consequently, the faster it breaks down, the more nitrogen it uses. Sawdust often breaks down very fast and, therefore, requires a lot of nitrogen. Some types tend to hold too much free water and can cause conditions that are too wet. This is particularly true in hot, wet summer areas and probably contributes to the myth that sawdust will kill a rhododendron. Leaves and needles of most kinds of trees are okay, although some kinds do breakdown rather fast and can be a hiding place for insects and diseases. Nut shells, spent hops, corn husks and a multitude of other things will work well as long as they are not alkaline and do not have toxic materials in them. If you do not know whether or not the material has been used with rhododendrons, try a small quantity for a time before going all out. While it is unlikely that anyone has ever used them, even ground-up rubber tires would provide air space in the soil and achieve the same purpose as many organic materials. For the finer water-holding part of the growing medium, the choice is often peat moss. In some areas good local peat moss is available, but in recent years good peat moss has been difficult to obtain and often the powder that is sold as peat moss is worse than none at all. This is particularly true if you use only this very fine peat moss to mix with clay soil. The result will be a soppy soil that has no ability to hold air. Try to obtain the coarse nursery grind. Now mix the actual medium (soil) in which you are going to plant your rhododendron. The old formula of one-third sawdust or bark, one-third peat moss, and one third garden loam is all right, providing the humus material (sawdust, etc.) is coarse enough to supply the necessary amount of air in the soil. Up to one-third of the soil volume should be air space, so use common sense to provide a mix that will give you this result. Almost any combination will work as long as it provides the necessary air. Remember: The slower the humus breaks down the better, because the longer those particles of humus are there, the longer the soil is going to contain a lot of needed oxygen. And, remember that organic material which breaks down too rapidly consumes lots of oxygen, which is going to have to be replaced. We now have the planting medium figured out, so let’s deal with the native soil. We have already determined how to tell if drainage is good or bad. If it is good, you can mix the planting medium into the top six to ten inches of soil and you are ready to plant. We are also assuming that the native soil is acid; if it is not, no matter how good the drainage, you are probably going to have to make a raised bed. If drainage is poor (and this true in many locations), you will need to plant nearly on top of the native soil. The illustrations will help show proper planting procedure. You may plant in a hole as this drawing shows if you have well drained soil. In poorly drained soil, if you dig a hole like this and fill it back with light soil, you may be creating a bucket which will hold stagnant water and kill your plant. Mulching is also important. The reasons for mulching are to keep the roots cool in the summer and protect them from sudden soil temperature changes in winter, to prevent drying out and to help keep the weeds down. In their natural environment rhododendrons have a mulch provided from their own leaves and those of the trees around them. The same is true of old plants in the garden; they provide their own mulch from the leaves they drop each year, so don’t be over anxious to rake out all of the fallen leaves. However, be aware that they are an excellent hiding place for pests and diseases. As to what to use as a mulch, just about any of those things which were stated earlier as good for providing air in the planting medium will also work as a mulch. You may plant in a hole as this drawing shows if you have well drained soil. In poorly drained soil, if you dig a hole like this and fill it back with light soil, you may be creating a bucket which will hold stagnant water and kill your plant. Be inventive, almost every area has some kind of waste product that can used for this purpose. Note: Do not use fine peat moss alone as a mulch; it will dry out and shed water like a thatched roof. Similarly, the use of black plastic is a bad substitute for proper mulching. When a rhododendron is newly planted, the roots are only in the existing ball and have not had time to grow out into the surrounding soil. 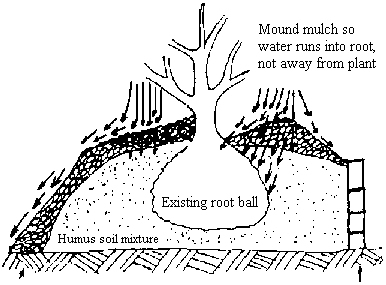 If the ball gets dry, water will not easily be reabsorbed into the ball from the moist adjoining soil. Since no roots have had time to grow into the new soil, they can be dry even though it is sitting in damp soil. they can be dry even though it is sitting in damp soil. It will actually do much good providing moisture that the plant is not able to bring up fast enough through its own roots. Many commercial rhododendron growers now have watering systems that turn on and off automatically during hot weather for this very reason, enabling them to grow plants in full sun that would otherwise burn badly. However, it is true that during flowering, overhead watering may damage the flowers. Also, in wet climates (particularly hot areas), if the foliage never dries out during the day, you may have more trouble with fungus disease. The main thing that we must make sure of is that the plant is getting wet. Quite often a plant will get completely dry and then no matter how much water you apply, the rootbal will just keep shedding it. The top of the soil may seem wet, and the soil around the plant may even be very wet, but the actual root ball of the plant is bone dry. This is especially true for newly planted rhododendrons, and it is the major reason for failure, or at least less than great success with that new plant. It is hard to believe that a plant can be within mere inches of a sprinkler that has been runnung for hours and still be dry, yet it can be SO TRUE! Rhododendrons do require adequate nutrients to grow and flower at their best, and these nutrients are usually provided from some form of fertilizer. Whether you use organic or “chemical” is your choice. Applied in proper amounts, either type will produce healthy plants. A properly fed plant is hardier and will withstand more cold than one that is under-fed. Research done by Dr. Robert Ticknor of Oregon State University indicates that more nitrogen is needed than what was once thought. He now recommends a 10-6-4 (nitrogen, phosphate, potash) formula. While phosphate does promote bud set, apparently the plant can only use a certain amount. Unlike nitrogen, phosphate and potash do not disappear from the soil, but build up little by little with successive fertilizing. Therefore, the old high phosphate formulas do not provide extra help to the plant. For the best growth and flowers on young plants in areas where the soil is not frozen all winter, apply fertilizer after the plant goes dormant sometime between late November and January, a second time in February/March, a third time in April/May and a final time in June/July. For most garden situations the old rule of “once before they bloom” and “once after they bloom” is still a sensible approach. Actually the fertilizer timing has nothing to do with the time the plant flowers, it simply means once in the early spring, probably March/April and a second fertilization about June/July. This timing will vary, depending on your climate, and is not critical.